YAYOI KUSAMA. ALL THE ETERNAL LOVE I HAVE FOR THE PUMPKINS, 2016, AT THE HIRSHHORN MUSEUM AND SCULPTURE GARDEN. WOOD, MIRROR, PLASTIC, BLACK GLASS, LED. COLLECTION OF THE ARTIST. COURTESY OF OTA FINE ARTS, TOKYO / SINGAPORE AND VICTORIA MIRO, LONDON. © YAYOI KUSAMA. PHOTO BY CATHY CARVER. But art doesn’t really work that way. You don’t need a single dose to be satiated. There are paintings on my walls that I look at every single day and they still make me gag with delight. Galleries and museums have permanent collections that you can visit over and over again with different effects. For example, I didn’t see the appeal of Inuit art for a long time. Then, all of the sudden, the work popped into focus like a magic eye poster and I got obsessed. What a beautiful thing. It’s obvious that Infinity Mirrors would be an incredible experience. My lack of interest in attendance has nothing to do with the art. I only saw a one-room installation in Copenhagen—the AGO has seven rooms. It’s a complete Kusama bonanza with paintings, drawings, sculptures, photographs, and enough retail merch to make your own personal shrine. Plus, Kusama deserves all the fanfare. Now 89 years old, she started making her infinity rooms in 1963 and set a record for the most expensive sale of a living female artist’s work. She’s a true legend and her iconic work is just down the street from me in Toronto. It should be easy as pie to pop by this exhibit, but it feels like so much effort. Here’s how the ticketing process for Infinity Rooms works: There are specific sign-up days and then you wait online to get your ticket for a future date. Once you’re in the exhibit, you should be prepared to line up again for each room. This process allows you to linger inside an infinity room for a quick 30 seconds. And the wait-to-reward ratio is skewed. When Infinity Rooms first launched at Washington, D.C.’s Hirshhorn Museum and Sculpture Garden in February 2017, they introduced online ticketing as a way to control crowds and sell memberships. The system, which you’d usually experience when buying arena concert tickets, worked well—the Hirshhorn reported that their membership base was 20 times larger because of Kusama. With the hype that’s built since then, it’s safe to assume that the AGO and other museums are seeing similar, if not more significant, growth in membership and attendance numbers. I have no personal gripe with this. How could I? This type of attention and funding to arts institutions should give us all hope for the future. 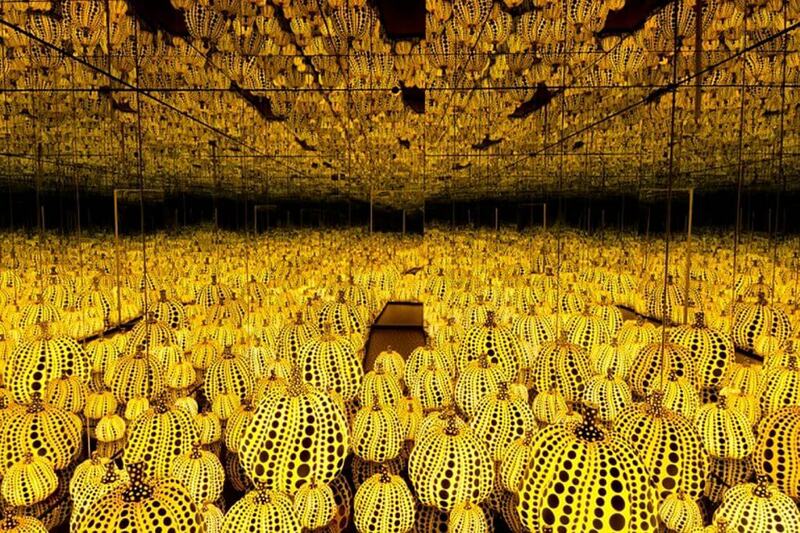 The exhibit has gone mainstream, making Kusama a household name and social media staple. It’s a great opportunity for the AGO to make hay while the sun is shining, and then feed that hay to all the great local artists that use free beer to entice visitors to their gallery shows. At this point I should confess that I tried to get tickets. I set alarms and calendar events to remind myself, but it hasn’t worked out. I once waited for an hour until my browser crashed. For me, this exhibit feels like a schlep. So, yes, I’m being lazy. I’m resting on the laurels of that trip to Denmark four years ago, and denying myself a transformative experience. But it’s just that there’s so much art out there that doesn’t require any effort at all. Every week, I have the option of seeing smaller galleries around the city—no tickets, no wait time. If you got tickets to Infinity Mirrors, don’t cry for me. I’m happy for you. I’ll even like your selfie and mean it. When we meet up in person, I want to hear all about your experience.